"Dear Miss Vanderbilt: I am going to Europe, first class, on the Queen Mary. Do I have to take a formal evening gown for each night? I am traveling alone. - Mrs. J.A." The first and last nights aboard ship are "don't dress" nights because on both of these days you are either packing or unpacking. 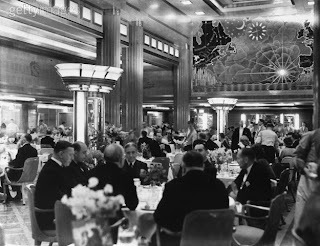 On the other three nights of the trip, especially if you are traveling alone, I would suggest two dinner dresses, and one evening dresses [sic] for the Captain's Dinner. The latter may be a short evening dress if you wish.